Day 1: Fly to Christchurch. Day 2 Christchurch: On arrival make your way to your hotel. Rest of the day at leisure. Days 4-5 Christchurch: Visit the sensational Cardboard Cathedral or enjoy a leisurely punt ride along the Avon River. Day 6 Christchurch/Queenstown: Transfer to the airport for your flight to Queenstown and on arrival make your way to your hotel. Days 7-8 Queenstown: Two full days to explore New Zealand’s adrenalin city Activities include bungee jumping, sky diving, jet boating and river rafting. Day 9 Queenstown/Rarotonga: Fly via Auckland to the Cook Islands. Time difference means you arrive the day before! 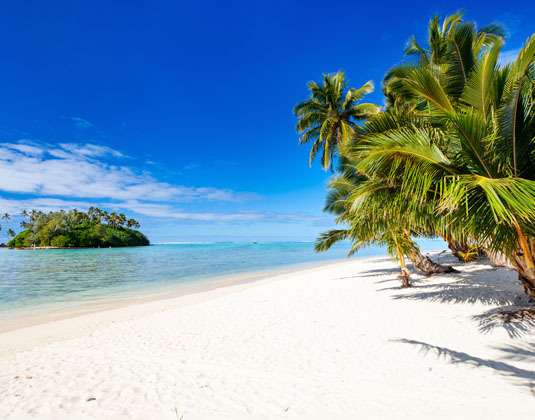 Days 9-15 Rarotonga: Enjoy tropical vistas, turquoise waters and idyllic beaches! Day 16 Rarotonga/Los Angeles: Overnight flight via Auckland to Los Angeles. Day 17 Los Angeles: Transfer to your hotel. Day 18 Los Angeles: See the sights of Hollywood, shop in style on Rodeo Drive or perhaps visit Disneyland. Day 19 Los Angeles: Make your way to the airport for your onward journey. Accommodation: 3★Plus Rydges Latimer, Christchurch; 3★ Copthorne Lakefront, Queenstown; 3★Plus Muri Beachcomber, Rarotonga and 4★ Millennium Biltmore, Los Angeles. Tour Price: The price shown is based on the best value travel dates in low season and includes international flights, domestic flights in New Zealand and accommodation.